Is it possible to print directly on GLASS with REINER marking systems? Yes, it is! Sensationally simple, safe and good. For this purpose, REINER offers a specially developed, quick-drying ink for direct printing on glass or other surfaces that are difficult to print. And the matching, mobile handheld marking devices. The cumbersome and unpopular printing of labels for glass packaging is a thing of the past! Glass. Clear. Direct printing on glass saves time and money. 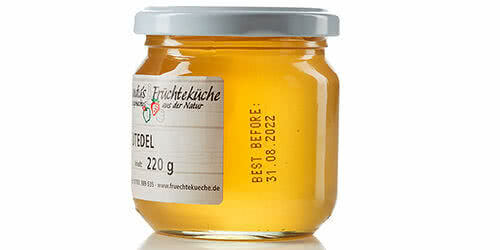 And it also looks much better than printed labels, which limit the view of the quality product. And it doesn't matter whether you want to inform about expiry date, serial number, product or manufacturer information. With the handy inkjet printer jetStamp 790 MP or the handheld marker jetStamp 792 MP, REINER has created the suitable, mobile marking device for your application. Especially for use with small and medium-sized batches. You want to mark the glass packaging of your food, cosmetic or laboratory products safely and simply? Then click on the button for more information. » Click here for detailed information on the topic: "Mobile printing on glass"
The 4th year of apprenticeship last month was the day for many apprentices to complete their training. With his very good final grade, REINER apprentice Bernd Dorer stood out among them in a special way. Where does the proverbial REINER quality come from? Have a look behind the scenes of the production of the manufacturer of stamps and marking devices in the Black Forest in this brief film. Can panels be labelled safely and easily directly on the multilayer installation station? Würth Elektronik in Niedernhall has dealt with this question in the production of printed circuit boards in the course of the implementation of “Industry 4.0”. The solution has now been found in cooperation with REINER.